As the Wellness Coordinator at NIFS, I get to meet a lot of great clients and help them attain their nutritional goals. 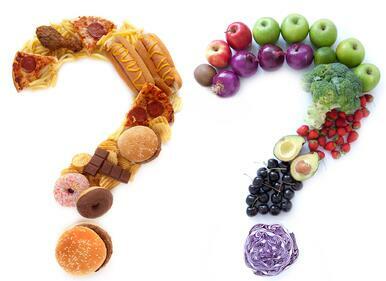 I have noticed some common weight-loss questions that arise during the sessions. Hopefully if you have been wondering the same things, these answers will give you some more insight. The best way to lose fat is to either increase the amount of calories you burn or decrease the amount of calories you consume. As you are doing this, you also need to make sure you are doing 2 to 3 days of strength training per week to build muscle. To decrease calories, it is important to keep track of what you are eating and see where you can decrease. This might mean decreasing the amount of coffee creamer you put in your cup of joe or swapping the potato chips at lunch for some raw veggies. Increasing your protein intake won’t automatically increase your muscle mass. If you are strength training 2 to 3 times per week, a simple calculation to know your protein needs is to divide your body weight in half and multiply by 1.5. Can you give me tips on how to lose weight? The first advice I always give to anyone wanting to lose weight is to start keeping track of your food. Studies have shown you eat 40% less when you write it down! This can be done with the apps available for your phone, using a website, or just jotting it down with a pen and a piece of paper. It will allow you to see when and why you eat and also will hold you accountable for what you are eating. The other thing that can be helpful with weight loss is to look at what you are drinking. Are you consuming empty calories from flavored coffee drinks, soda, juice drinks, or alcohol? Most people tend to eat the same amount of food no matter how many calories they consume from their beverages. So try to stick to water, low-fat milk, unsweetened tea, and 100% juices for the majority of your liquids. Every person is a different height and weight, and has varying levels of activity, so there isn’t one calorie number that works for all individuals to follow. Instead, use the simple Choose My Plate calculator that takes these factors into account to determine the proper amount you should be consuming. Not only does it give an overall number, but what is more important, it tells you how to get in that number. Recommended servings of grains, fruits, vegetables, dairy, meat and beans, and fat are given, along with some “extra” calories for those every-once-in-awhile food choices! If you are interested in having your questions answered during a personal nutrition consultation, please contact me at amitchell@nifs.org or 317-274-3432, ext. 239. Click below for more information on packages and pricing. I’ve tried everything. Why doesn’t my diet work? When you open your newsfeed, you see advertisements and personal testimonies from friends and family with weight-loss and dieting successes. That alone can be the motivation needed to give something new a try, but not everything works for everyone. Various weight-loss systems have time-sensitive supplements, complex counting systems, and other essential guidelines that you must follow strictly to be successful. The next fad diet may work, but what happens afterward? Do you continue that system forever? Should you follow a program designed for weight loss if you’re no longer trying to lose weight? Diets seem to always pose more questions than answers, and the “I’m going on a diet” phrase will inevitably lead to failure. Most people will transition “off the diet” when they reach their target weight, eventually returning to the previous eating habits that initially caused the weight gain. This up and down continues the yo-yo weight-loss cycle. This is why “dieting” doesn’t work. Some people can see results by making a few healthy choices or decreasing calories. Eventually everyone will hit a plateau, but the answer isn’t to further restrict nutrient intake. Long-term dieting can have a prolonged negative effect on metabolism, making it much more difficult for the body to use nutrients. Most people prefer restrictive diets in which they decrease total calories or put a limitation on types of foods consumed. These include but are not limited to fat-free, sugar-free, no carbohydrates, gluten-free, or protein-free. Others try overindulgent diets in which they eat nothing but one type of food. These diets are like the cabbage soup diet, protein-only diets, or having nothing but juices or meal-replacement shakes. However, both restrictive and overindulgent diets contribute to inadequate essential nutrients. Let’s be clear. A diet isn’t a restriction or an overconsumption of any foods. A diet consists of your daily intake of nutrients. 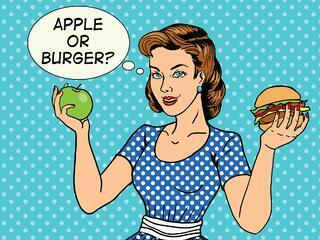 To be successful this year, you need to ask yourself why you want to diet. Are you looking to temporarily lose weight, or are you looking for a long-term solution? If you’re looking for short-term weight loss, continue to check Facebook for inspiration. If you are ready to stop the yo-yo “dieting,” you are ready to make a healthy lifestyle change. Rethink your daily diet to include foods that will satisfy your hunger and foods you’ll enjoy. Say goodbye to the old diet foods that you used to endure and say hello to flavorful, real, whole foods. Instead of depriving your body of the energy and fuel it desperately needs to function, feel free to eat a meal that consists of at least 300 calories. Just keep in mind that dieting alone never works for long. Take that as a sign to progress to the next step and gradually add activity and exercise into your daily routine. For more nutritional advice, a NIFS Registered Dietitian can help give you direction and focus your energy in a positive way. The My Nutrition Coach mobile app allows members to interact daily with a Registered Dietitian at NIFS. You will receive feedback, suggestions, and information on ways to improve your nutrition and help you achieve results. To get started with My Nutrition Coach, contact NIFS Registered Dietitian Angie Scheetz at ascheetz@nifs.org or by phone at 317-274-3432 ext. 239. Are you looking to give back to the community or help others? Did you know that you could do this while exercising too? If you have a SmartPhone or access to the Internet, there are several free apps you can download or sign-up through. Each application has a different organization or fund that you have the option of helping! I researched and found the top rated opportunity, along with a few others I have heard great things about. Charity Miles is a free app for the iPhone and Android. The smartphone application allows for you to earn corporate sponsorships for charity while walking, running, or biking. If you choose to walk or run, you will earn 25 cents per mile and 10 cents per mile while biking. There are 28 different charities to choose from and you can earn up to their initial $1,000,000 sponsorship pool. Download the app, turn it on, choose a charity, your exercise, and press start. So easy! WhoIRun4 is a non-profit organization that pairs a runner with one special needs child or adult. The purpose of this organization is to provide the runner with motivation while sharing who they are running 4 and bringing awareness to diseases and disabilities of all types. By visiting WhoIRun4 a runner can just sign up and find someone to be matched with. There are guidelines to this program, which can also be found on this website. Dedicate your workouts in a variety of ways such as making signs, t-shirts, or uploading pictures and tagging the individual or child’s parent on the organization’s Facebook group! Get creative and give your workout a whole new motivation! The two organizations described above are my two favorites. Other popular opportunities include Erndit, Plus3Network, Upwave, and Charity Bets. Through these apps, you can log your activities and earn rewards to help your chosen charity. By visiting their links, you can learn more about the programs how you can sign-up to help. These opportunities are a great way to get inspired. Why not get healthy with friends or family?! You have the ability to set goals, work towards them, create a positive camaraderie, and have fun while doing it! The adrenaline rush one can get by exercising to help a charity is all the more motivation to work harder! If you are having trouble finding an activity to log, stop by the fitness center and pick up a group fitness schedule or ask about the fitness center incentive programs. They are a great way to meet new people and spread the word about one of these charitable opportunities! Comment and share your favorite apps for fitness. Have you utilized one of these apps to raise money for a charity? Are you looking for fitness tips, a little extra motivation or some exercise accountability? There’s an app for that! Over the past few years, health and fitness apps have grown and can provide information such as, distance and pace, strength, circuit and flexibility routines, estimate calorie expenditure, and some can measure your heart rate. Some apps will send daily fitness tips or motivational statements to help keep you on track with your exercise routine. But, if you’ve ever tried to search for health and fitness apps on your phone, you know how overwhelming it can be. There are hundreds and hundreds of fitness apps out there for your smart phone. I have narrowed them down by choosing a few! Upgrades are available for some, but the free versions work well by themselves as well. You can find more detailed descriptions and reviews online and decide for yourself which apps will help you the most. What is your favorite fitness app? Comment below and share or jump over to our NIFS Fitness Management Facebook page and tell us your favorite!